Daily Mirror, 30 November, page 17, no title, author unknown, England. Incidentally, actress Colette Wilde, who used to be ITV’s weathergirl for the Midlands and North, turns up in "The Avengers" tonight (ITV 10.05) as a conspirator out to conquer the world by a poison plot. Just to underline what a charming girl she is, she plans to use Cathy Gale (Honor Blackman) as a human sacrifice at a Roman-style party. 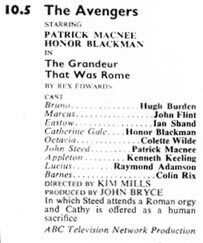 Manchester Evening News, 30 November, page 5, Max North's Telereview, ?, England. 'THE AVENGERS' - ROMAN STYLE. Every week the creators of "The Avengers" dig their tongues more firmly into their cheeks as they produce more and more bizarre settings for the stories of agent Steed and helper Cathy. The latest, "The Grandeur That Was Rome", on ITV to-night is the most startling yet in the show's glances at oddities of human behaviour. A tycoon with political ambitions (played by Hugh Burden, pictured right conquering his future empress Colette Wilde) lives in a neo-Roman villa, with followers in togas. Being of too nervous a disposition to play bingo myself, I have been doing some revision on The Avengers, second time around, and studying its technique. At least, I mean to notice the technique, but keep getting distracted by those ghastly hats and fascinating snobbery. Steed, for instance, insists that his dog gets raw liver, seaweed powder and a walk exactly three miles a day. On what porridge was James Bond's dog reared? The violence is casual and relished far less than it is in the Fleming novels. The dramatic settings are crude, but deliciously inventive. There was a very good one last night about a small fascist thug who thought he was a kind of Caesar and based his life on the nastier habits of Imperial Rome. Disturbingly probable, and one can only hope no one was fired to go and do likewise.